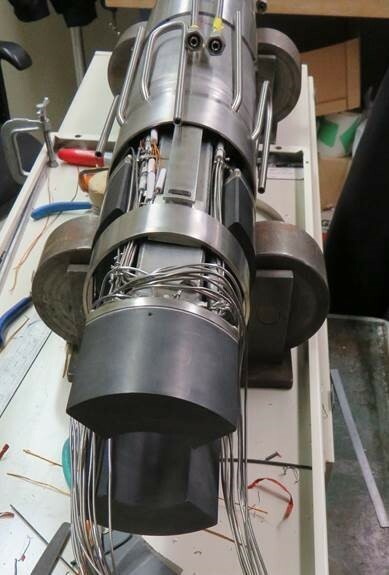 The unique capability of S-Bond solders to join graphite and ceramic to metals was the solution for Los Alamos for fabricating core elements of their Proton Collimator used in its Proton Radiography facility. 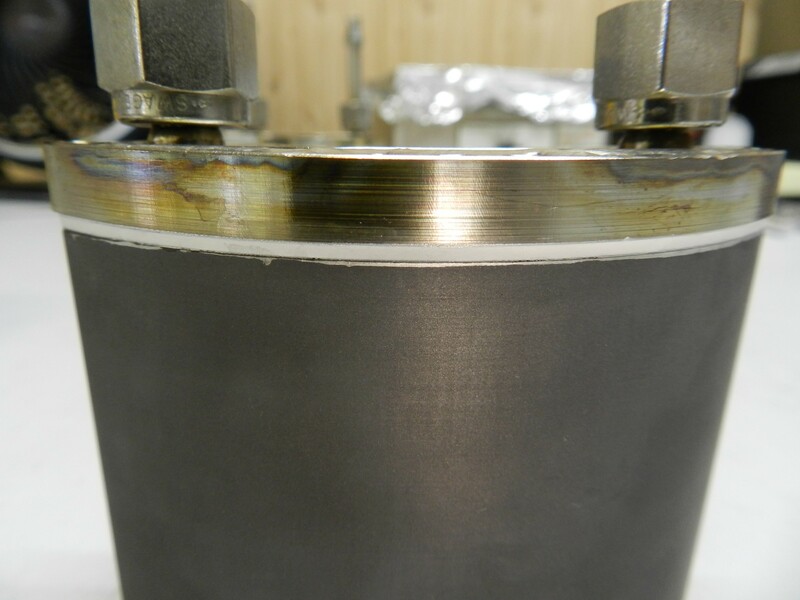 Conventional brazing was considered but their large differences in Coefficient of Thermal Expansions (CTE’s) limited brazing since on cooling from brazing temperatures (over 800°C), the resultant CTE derived residual stresses would have likely cracked the ceramic, graphite or torn the bond interface. Figure 1 illustrates the graphite – ceramic-stainless steel composite assembly that required stable, thermally and electrical conductive connection between the assembly’s elements. Los Alamos researchers reached out to S-Bond Technologies to use its S-Bond solders to join these disparate materials. Normally plating would have to be used to make the ceramic and graphite materials solderable. In the case of S-Bond joining, the same solder and soldering process was used to make the joint between the graphite base, the insulating alumina sheet and the stainless steel plate, as depicted in Figure 1. Figure 1. Illustration of the proton collimator elements joined with S-Bond solders. The soldering of this composite started the S-Bond metallization of the bonding surfaces of the graphite base and the alumina insulator. In this process, S-Bond metallization paste was applied to the one surface of the graphite and the two opposite sides of the alumina paste. The graphite and the alumina sheet with pastes applied, were heated to 960C in a vacuum furnace in order to react the elements in the paste with the graphite and ceramic surfaces to create a chemical bond between the solder and the graphite and alumina. After metallization these parts’ surfaces are solderable with a well bonded interface. The Graphite base, the alumina insulator plate and the stainless steel header were heated to 250C where S-Bond 220 solder filler metal was applied via melting on and mechanical activation (spreading by heated blade or bush) to pre-tin the faying surfaces of the assembly. Once the S-Bond solder filler metal was pre-placed (pre-tinned) the parts kept hot at 250C, were placed together in an alignment fixture to align the constituent parts accurately and then pressed / loaded with 50 lbs of deadweight as the bonded assembly was cooled. Figures 2 illustrates the solder bonded composite proton beam collimator component. The pictures show the two S-Bond solder interfaces connecting the water cooled Stainless steel end plate, to the ceramic insulator plate, then connected to the graphite cathode. Figure 2b. Side view of S-Bond joined collimator part. Figure 3 illustrates the Proton Collimator with the S-Bond joined parts being assembled at Los Alamos National Laboratory (LANL). There were two S-Bond joined parts per assembly. 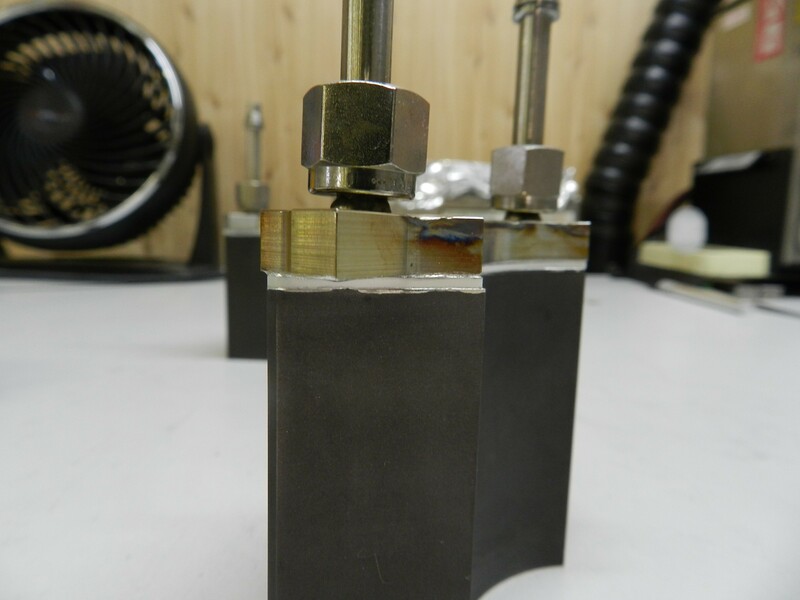 These bonded component assemblies worked very well and enables LANL engineers to successfully implement their design. Figure 3. Proton Collimator with two S-Bond joined composite being mounted. LANL engineers were able to utilize S-Bond’s unique capability to solder join stainless steel to ceramic to graphite. If you have such joining challenges, Contact Us for incorporating S-Bond joining in your assemblies. This entry was posted in Ceramic-Metal Bonding, Dissimilar Materials Bonding, Graphite Bonding, Soldering & Brazing and tagged ceramic bonding, Graphite Bonding by sbondadmin. Bookmark the permalink.